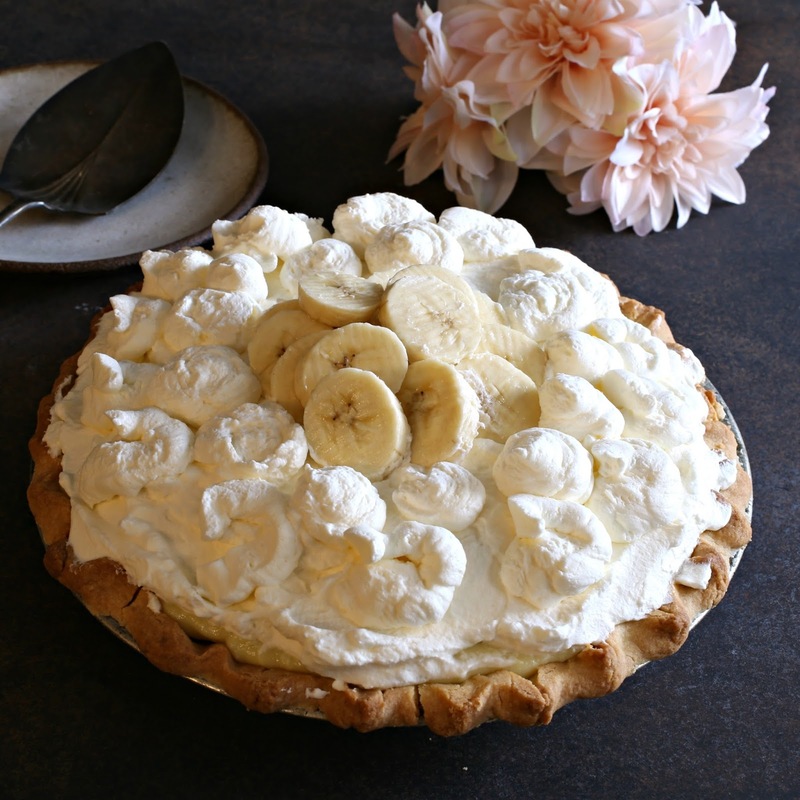 For those people who know me well, the only surprising part about me baking a banana cream pie is that it's the first time I've ever done it. And surprising because it is literally my favorite dessert of all time. When I was growing up, Sunday was family day and my father used to pile us all into the car and head somewhere, anywhere, out of the city. Sometimes it was the zoo or the aquarium but more often than not it was just a country drive upstate with a stop at a state park and an early dinner at a roadside diner. 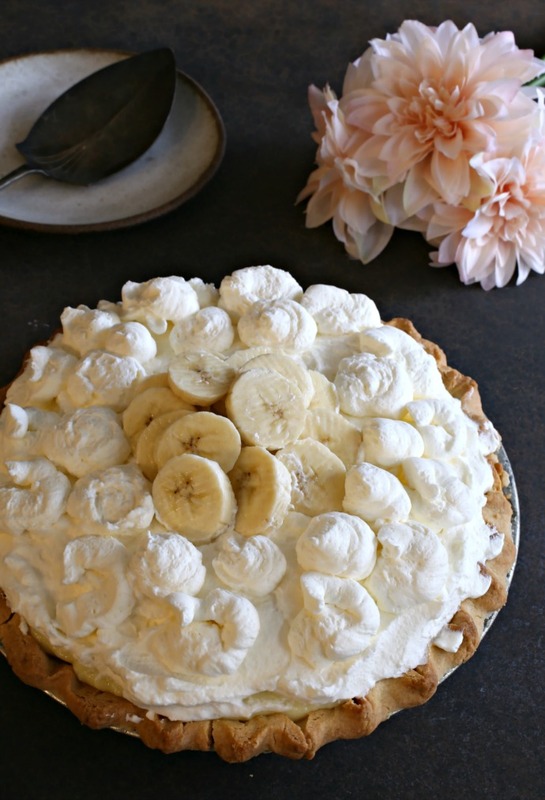 And that's where the banana cream pie comes in, of course. I never even cared what I ate for the meal but I wanted my banana cream pie for dessert and it seemed like only roadside diners knew how to make them properly. As an adult in New York City, I don't run into the old style pie much anymore. I find variations with chocolate (not a combo I like) or butterscotch (delish but not the classic) and online recipes that use Nilla wafers and pudding fillings. All tasty but not my childhood classic. So I finally took myself to the task and I went old school all the way. 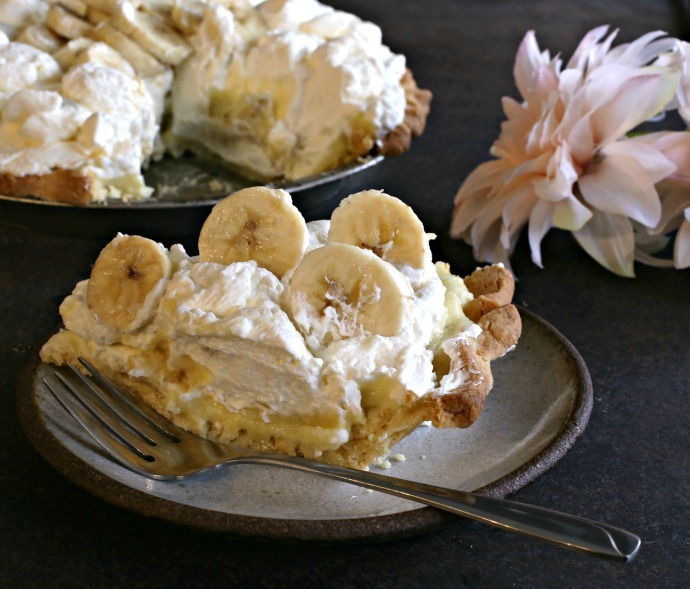 Sweet, buttery shortcrust, pastry cream with real banana flavor and sweet whipped cream. Not gonna lie - I inhaled this. Enjoy! Make the crust by adding the flour, butter, sugar and salt to a food processor. Pulse a few times just until the mixture resembles course crumbs. Beat together the egg yolk and heavy cream. With the machine running, pour the mixture through the feed tube until a dough ball forms. Wrap in plastic and refrigerate for at least an hour. Roll out the dough to approximately a 9" circle and place in an 8" pie pan. Crimp the edges. Place a sheet of aluminum foil into the pie plate and fill with pie weights or dry beans. Bake for about 20 minutes, remove the foil and beans and continue baking for an additional 10 minutes or until the crust is a light golden brown. Set aside to cool. Add the sugar, corn starch, salt, whole milk, vanilla and banana to a pot. Cook on medium heat, stirring often, until the sugar dissolves, the banana breaks down and the mixture begins to thicken. Beat the eggs together in a separate bowl. Add a couple of tablespoons of the hot custard into the eggs and whisk to temper them. Add the eggs into the pot along with the butter and continue whisking to cook the eggs and thicken the mixture. Pour the mixture through a fine mesh strainer to remove any lumps or cooked pieces of egg. Cover with plastic wrap and refrigerate until chilled. Using a stand or hand mixer, whip together the heavy cream, powdered sugar, vanilla and salt until the mixture thickens into cream. This will take about 7 minutes. 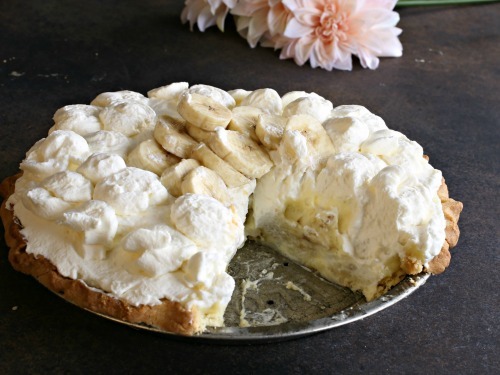 To assemble the pie, peel and slice the 3 ripe bananas and layer 2 1/2 of them onto the bottom of the pie crust. Top with the banana custard followed by the whipped cream. Top with the remaining sliced half banana.